Most researchers agree the onion has been cultivated for 5000 years or more. Since onions grew wild in various regions, they were probably consumed for thousands of years and domesticated simultaneously all over the world. Onions may be one of the earliest cultivated crops because they were less perishable than other foods of the time, were transportable, were easy to grow, and could be grown in a variety of soils and climates. In addition, the onion was useful for sustaining human life. Onions prevented thirst and could be dried and preserved for later consumption when food might be scarce. While the place and time of the onion's origin is still a mystery, many documents from very early times describe its importance as a food and its use in art, medicine, and mummification. Onions are a nutrient-dense food, meaning that while they are low in calories they are high in beneficial nutrients like vitamins, minerals and antioxidants. One cup of chopped onion contains approximately 64 calories, 15 grams of carbohydrate, 0 grams of fat, 0 grams of cholesterol, 3 grams of fiber, 7 grams of sugar, 2 grams of protein and 10% or more of the daily value for vitamin C, vitamin B-6 and manganese. Onions also contain small amounts of calcium, iron, folate, magnesium, phosphorus and potassium and the antioxidants quercetin and sulfur. Onions differ in the size, colour and taste. Spring onions are grown in warmer climates and have a milder, sweeter taste. Storage onions are grown in colder weather climates and generally have a more pungent flavour and are usually named by their colour: white, yellow or red. Smaller onions come in many types, such as chives, leeks and shallots. Treatment for Heart Ailments: Onions act as anticoagulants, also known as blood thinners, which in turn prevents the red blood cells from forming clumps. These blocks and clots can lead to heart disorders or cardiovascular diseases. Onions were historically as a preventative medicine during epidemics of cholera and the plague. 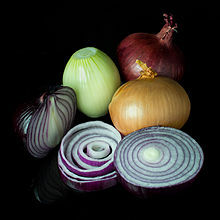 They were apparently eaten by Roman emperor Nero as a cure for colds, and its reputation has made onions a popular component in the diets of many countries. The antibacterial properties of onion include extensive antifungal applications, which have made it a household name in antifungal relief. The onion plant can be grown on well-drained and moist soil. You can even grow them in your own backyard or garden to reap its health benefits. They form an important part of many culinary preparations in cuisines around the world, and they are also known as ‘companion plants’, meaning they grow well when around other vegetables and plants. In Egypt, onions were considered to be an object of worship. 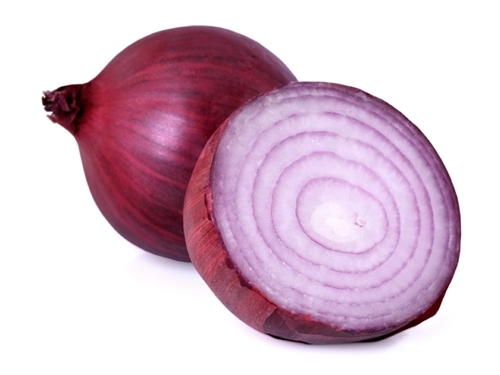 The onion symbolized eternity to the Egyptians who buried onions along with their Pharaohs. The Egyptians saw eternal life in the anatomy of the onion because of its circle-within-a-circle structure. Paintings of onions appear on the inner walls of the pyramids and in the tombs of both the Old Kingdom and the New Kingdom. The onion is mentioned as a funeral offering, and depicted on the banquet tables of the great feasts both large, peeled onions and slender, immature ones. They were shown upon the altars of the gods. Frequently, Egyptian priests are pictured holding onions in his hand or covering an altar with a bundle of their leaves or roots. In mummies, onions have frequently been found in the pelvic regions of the body, in the thorax, flattened against the ears, and in front of the collapsed eyes. Flowering onions have been found on the chest, and onions have been found attached to the soles of the feet and along the legs. King Ramses IV, who died in 1160 B.C., was entombed with onions in his eye sockets. Some Egyptologists theorize that onions may have been used because it was believed that their strong scent and/or magical powers would prompt the dead to breathe again. Other Egyptologists believe it was because onions were known for their strong antiseptic qualities, which construed as magical, would be handy in the afterlife. Onions were eaten by the Israelites in the Bible. In Numbers 11:5, the children of Israel lament the meager desert diet enforced by the Exodus: We remember the fish, which we did eat in Egypt freely, the cucumbers and the melons and the leeks and the onions and the garlic. In India as early as the sixth century B.C., the famous medical treatise Charaka Sanhita celebrates the onion as medicine diuretic, good for digestion, the heart, the eyes, and the joints. Likewise, Dioscorides, a Greek physician in first century A.D., noted several medicinal uses of onions. The Greeks used onions to fortify athletes for the Olympic Games. Before competition, athletes would consume pounds of onions, drink onion juice, and rub onions on their bodies. The Romans ate onions regularly and carried them on journeys to their provinces in England and Germany. Pliny the Elder, Roman keen-eyed observer, wrote of Pompeiis onions and cabbages. Before he was overcome and killed by the volcanos heat and fumes, Pliny the Elder catalogued the Roman beliefs about the efficacy of the onion to cure vision, induce sleep, heal mouth sores, dog bites, toothaches, dysentery, and lumbago. Excavators of the doomed city would later find gardens where, just as Pliny had said, onions had grown. The bulbs had left behind telltale cavities in the ground. The Roman gourmet Apicius, credited with writing one of the first cookbooks (which dates to the eighth and ninth centuries A.D.), included many references to onions. By the Middle Ages, the three main vegetables of European cuisine were beans, cabbage, and onions. In addition to serving as a food for both the poor and the wealthy, onions were prescribed to alleviate headaches, snakebites, and hair loss. They were also used as rent payments and wedding gifts. Later, the first Pilgrims brought onions with them on the Mayflower. However, they found that strains of wild onions already grew throughout North America. Native American Indians used wild onions in a variety of ways, eating them raw or cooked, as a seasoning or as a vegetable. Such onions were also used in syrups, as poultices, as an ingredient in dyes, and even as toys. According to diaries of colonists, bulb onions were planted as soon as the Pilgrim fathers could clear the land in 1648.